Ah the summertime, the the sun, the heat, the blossoming of flowers, wait… are those zucchini blossoms? Mmmmmmm, zucchini blossoms. The wonderful delicate flavor of the blossoms whisper summer and memories of my grandmother. Since the blossoms are delicate and only available during the growing season so we really look forward to them every year, in fact.. it’s become an obsession! They’re also impossible to find in regular grocery stores and very rare to find in specialty stores, so if you see them pick up a pack or two. This is seasonal cooking at it’s finest because if you miss the window of opportunity, you miss it. 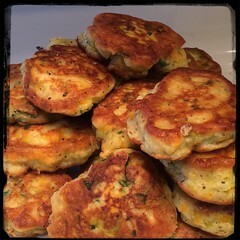 This recipe for fritters is one of the most common ways to use the blossoms, other variations include stuffed blossoms with ricotta, Risotto (Risotto ai Fiori di Zucca), pizza (as a topping) and pasta of course! Remove stems, receptacle (base), spiny ‘sepals’ and pistils leaving only the petals. *For plain or stuffed zucchini blossoms, remove the spiny ‘sepals’ from the base of the zucchini blossoms as well as the pistils. 2. Combine milk, egg, zucchini flowers, onions, garlic, salt, pepper and optional pecorino cheese in a separate bowl and mix well. 3. Mix all together together and mix until the batter is a good consistency.